Establishing a sound underlying data architecture is crucial. At TSP Consulting, we take a holistic approach when designing data architecture. SOC Controls on Data Integrity. Internal operations, accounting and third-party audits all require accurate and consistent data at all times. Standardized data for all reporting. 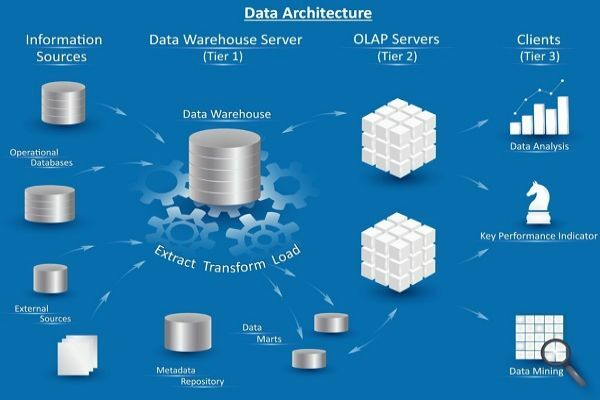 An effective data warehouse design de-normalizes the data and simplifies Report Design and Development. Data Translation. Pulling in data from disparate systems requires the data to be translated to fit a uniform reporting schema. Eliminate Reporting Blackouts. A sound data architecture design optimizes data refreshes and eliminates reporting blackouts. Minimize performance impacts on production systems. A sound data architecture minimizes performance impacts that often occur during data refreshes and running large report queries. SQL Log Shipping. We have a proven track record implementing effective SQL log shipping strategies and have developed best practices that address many of the common pitfalls. SQL Server Integration Services (SSIS). Being able to react to changing data formats from upstream systems is key to any reporting platform. SSIS is a fast and flexible data warehousing tool used for data extractions, data imports, data transformation, and data loading (ETL).